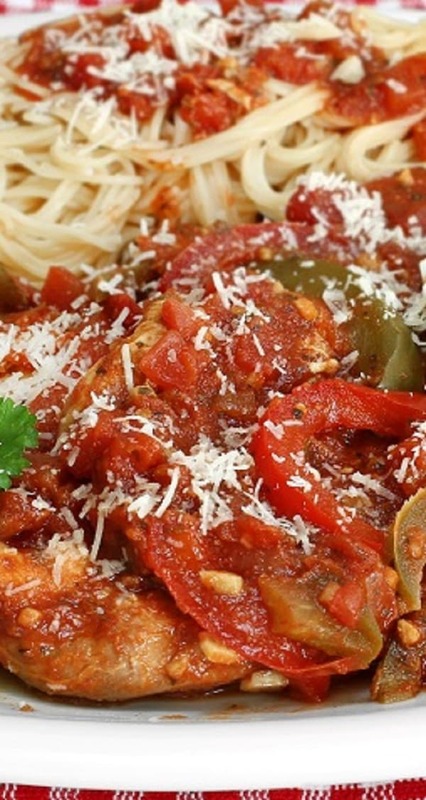 Skinless and boneless chicken breasts are topped with Mediterranean flavors in a flavorful tomato-based sauce. Very delicious! 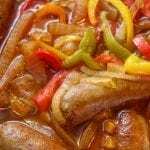 Instructions: In 6-quart (6L) slow cooker, combine all ingredients, except olives, lemon juice, salt, black pepper, and rice. Mix well. Cover the cooker and cook on low-heat setting for 6-8 hours, adding olives during last 30 minutes. Turn off the crockpot and open the lid. Season to taste with lemon juice, salt, and black pepper. Stir well. Discard bay leaf. Serve chicken and tomato mixture over cooked rice. Sprinkle chicken thighs with salt and black pepper. Set aside. Heat olive oil in a alrge nonstick skillet over medium-high heat. Add seasoned chicken thighs and cook, turning once, until nicely brownes, for about 3-4 minutes per side. Remove cooked meat from the skillet and transfer to the slow cooker. Reduce heat in the skillet to medium. Add more olive oil. Add chopped garlic and onion and cook, stirring, until soft. Transfer onion mixture to the slow cooker. Add remaining ingredients and stir well to combine. Cover the cooker and cook on low-heat setting for hours. Turn off crockpot and open the lid. Discard bay leaf. 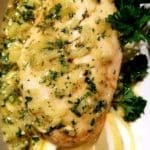 Transfer cooked chicken thighs to a cutting board. Discard the bones and shred the meat. 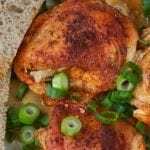 Return shredded chicken to the crockpot. Stir in fresh parsley. Serve over cooked pasta topped with grated Parmesan cheese.